In 1976, after years of successfully shooting used Mamiya TLRs, I bought my first Hasselblad with a Carl Zeiss 80mm T* lens for the princely sum of $650. Adjusted for inflation that would make it $2,774 today. A Hasselblad H5D-40 with an 80mm lens costs $13,495 today because…technology. And (as they say in movie trailers) in a world where a Canon EOS 5DS packs a 50.6-megapixel punch and a Nikon D800E produces 36.3 megapixels do you even need medium format? The short answer is that you do if you want the ultimate image. 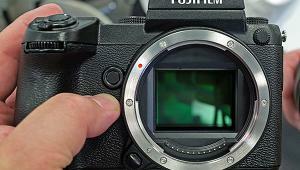 Just as 6x6cm beats 24x36mm film for resolving power, a 53.7x40.3mm chip trumps a 24x36mm image. (Editor's note: This story first appeared in print before the launch of the Hasselblad H6D.) 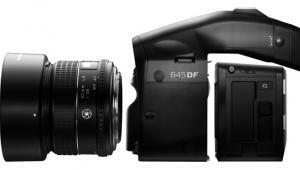 Hasselblad’s H5D-40 with an 80mm f/2.8 HC AF lens ($13,495) has a 43.8x32.9mm 40-megapixel CCD sensor. The camera has an aluminum inner core and stainless steel housing with large, ergonomic buttons and weather sealing. The H5D-40 is compatible with the HC/HCD lens shutter lenses, allowing flash sync at all shutter speeds. V System Zeiss lenses can be used with the optional CF adapter ($1,645). The aperture range of the 80mm lens is f/2.8-32 with Immediate Focus Confirm so you don’t have to stop to check to see if your shot was in focus. The eye-level viewfinder has 3.1x image magnification with diopter adjustment but other viewfinders, including the HVM Waist Level Viewfinder ($375), are available. The H5D-40 has a three-inch LCD with storage via CF cards or hard drive. Captured images use Hasselblad’s 3FR lossless compressed Raw files with 1/4 resolution print-ready JPEGs. 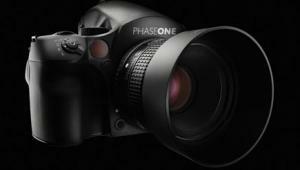 The H5D-40 is bundled with Hasselblad’s Phocus software and Adobe Lightroom. Both support a plug-in for tethered operation in the field or studio. Who’s It For: Pros who like the classics. It’s a modern gateway into a celebrated standard. 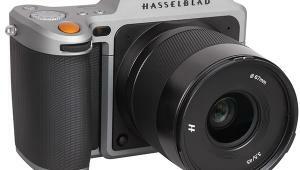 Why I Like It: While today’s Hasselblad is a long way from that 500CM I bought in 1976, the mystique remains. The Mamiya Leaf Credo 80MP Digital Back with a 645DF and an 80mm f/2.8 LS D lens ($28,495) houses a 53.7x40.3mm CCD sensor with an ISO range of 35 to 800 and shutter speeds from 1/10,000 second to 120 seconds. It’s weather sealed, offering protection when shooting in less than optimum conditions. The Sekor 80mm f/2.8 LS D is a leaf shutter lens with flash sync speeds of up to 1/1600 second. You can choose between the integral focal plane shutter or leaf shutter for sync speeds up to 1/1600 second. The camera’s 3.2-inch LCD has a 170-degree viewing angle with touchscreen controls extending beyond the LCD to keep the viewing area clean. Shooting modes include aperture priority, shutter priority, programmed and manual modes with TTL metering, center-weighted average, and spot, including auto-bracketing. Lossless 16-bit file compression accelerates file handling without image quality loss. The Leaf Credo back offers Capture One software and with Capture Pilot you can preview images from Apple’s iPhone or iPad and remotely control your camera. Who’s It For: Perfectionists who appreciate the camera’s design and ergonomics and image quality that a large chip provides. Why I Like It: A classic name bringing a “big chip” to the imaging game. 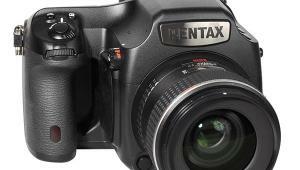 The original Pentax 645 was a brilliantly designed film camera and the Pentax 645Z ($6,996) follows in that tradition. 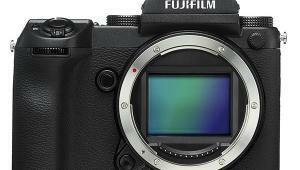 Its 43.8x32.8mm CMOS sensor produces 51.4 megapixels and is designed without an anti-aliasing filter to maximize sharpness. Raw files can be recorded at 14-bit and saved using proprietary PEF or DNG formats. Two SD slots offer compatibility with FluCard and Eyefi cards. The 645Z has an aluminum alloy chassis and a magnesium alloy shell with 76 weather seals to keep out moisture and dust. 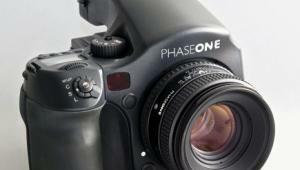 An ISO range from 100 to 204,800 and a Prime III image processor lends itself to fast image capture at 3 fps. The SAFOX II autofocus module has 27 autofocus points, including 25 cross-type sensors with three sensors dedicated to low-light focusing. There’s video capture at 1080 60i/30p/24p with a dedicated button for switchover from stills to video. Interval recording for time-lapse videos is supported with 4K output. There’s an external microphone jack for audio input with manual sound level control and monitoring. An HDMI port outputs HD images and a USB 3.0 jack enables fast image transfer. A free plug-in provides seamless tethered shooting support with Adobe Lightroom, along with the USB 3.0 output. Who’s It For: Photographers who would like the capabilities of more expensive medium format cameras at (for this category) an affordable price. Why I Like It: Like the original film camera, the 645Z is full of state-of-the-art features and might be the one true bargain in a field of expensive medium format cameras. 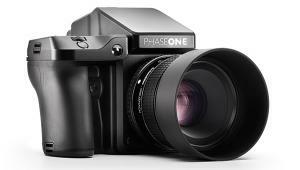 Phase One’s XF camera combines an 80-megapixel IQ3 back, a prism viewfinder, and an 80mm Schneider-Kreuznach lens ($48,990). The IQ3 back has a 53.7x40.4mm sensor and is milled from a single block of aerospace-grade aluminum, offering exposures of up to 60 minutes. 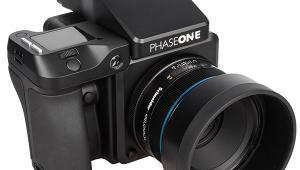 Phase One IQ3 backs have 3.2-inch Retina-type LCDs and include built-in accelerometers to help align images at the moment of capture. The IQ3 backs provide four different tethering options: FireWire 800, FireWire 400, USB 3.0, and USB 2.0. When tethered using FireWire 400 or FireWire 800, the IQ3 charges a battery (if present) in the battery bay. The user-upgradeable OneTouch User Interface is a combination of dials, keys, and touchscreens, allowing you to personalize camera controls for specific shooting requirements. The XF camera system includes a 90-degree solid glass prism viewfinder and for traditionalists, the waist-level finder can measure exposure thanks to Phase One’s HAP-1 autofocus platform. In addition to the 80mm, two new Phase One Schneider-Kreuznach leaf shutter lenses—120mm and 35mm—can resolve beyond 100 megapixels with support for 60 legacy lenses. Why I Like It: It’s designed for a standard not a price point. If there is any challenge to Hasselblad in the photography world for iconic status it’s from Leica. Their Model S aka Typ 007 ($16,900 body) looks like a traditional Leica camera albeit a hefty one, weighing in at 7.4 pounds. 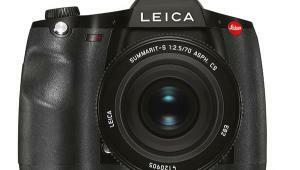 (A Leica SL weighs 3.7 pounds and a Hasselblad H5D-40 body is 7.75 pounds.) The Leica S has a weather-sealed, magnesium alloy body to protect against dust and moisture, including interface ports and lens mount. 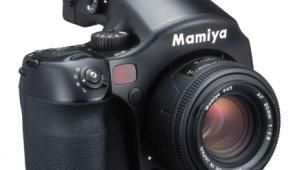 The S has a 37.5-megapixel (45x30mm) sensor and the lack of an optical low-pass filter enhances detail and resolution. On-sensor microlenses produce consistent and even light distribution, ensuring edge-to-edge sharpness and illumination. The S is capable of shooting 4K video files, with options for audio and video recording. The camera has a top ISO of 6400 and can record up to 32 consecutive DNG files—Leica’s preferred Raw format—at 3.5 fps. 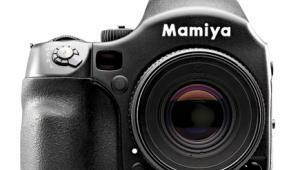 When manually focusing, its predictive autofocus system uses focus peaking in Live View mode. A three-inch LCD works in combination with the 0.87x magnification pentaprism. Built-in Wi-Fi connectivity enables remote control and wireless transfer of files to mobile devices, while a GPS module allows location information to be added to an image’s EXIF data. Who’s It For: Those photographers for whom the Leica name holds a special place and I’ll bet it impresses their clients, too. Why I Like It: It’s a Leica albeit a BIG one but it’s hard to get past the lineage. Who’s It For: If you want to produce the ultimate image, you need an ALPA. Why I Like It: Look at it, just look at any ALPA. What’s not to like? It seems digital capture keeps shrinking the number of camera manufacturers, especially classic German companies. 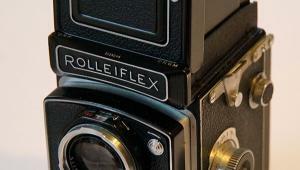 DHW-Fototechnik stopped making the innovative and digitally capable Rolleiflex Hy6 and on April 29, 2013, Hasselblad discontinued the V-series (original-style) film camera. 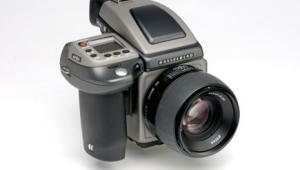 However, since Hasselblad cameras are seemingly infinitely repairable, many of them are still in use. In fact, 500-series cameras seem to be making a comeback with film shooters and for the same reason they were popular to start with—they are compact, reliable, and have sublime Carl Zeiss optics. But the 500 series is also modular, which means you can add Hasselblad’s CFV-50c digital back ($9,995) with a 50-megapixel (43.8x32.9mm) CMOS sensor that’s compatible with most Hasselblad V System cameras, even those that date back to the 1950s. The back produces lossless compressed Raw files of 65MB and 8-bit TIFF files of 154MB. It has an ISO range of 100 to 6400 at 1.5 fps along with long exposure times up to 12 minutes. It has a three-inch LCD and images can be saved to either a CompactFlash memory card or to a tethered computer via FireWire 800. Who’s It For: Owners of older Hasselblad cameras who want to update to digital and shoot with their older but dependable gear. Why I Like It: Proof that Victor Hasselblad was a genius and even after 60 years the modularity of his system still works. Plaubel’s Makina medium format film folding camera had a leaf shutter and rangefinder focusing along with a collapsible bellows. Plaubel & Co. manufactured cameras in Germany from 1912 to 1953 and later Doi Group designed Makina cameras that sold from 1978 into the 1980s. These days used Makinas sell for more than $1,000, but if you want to get that lovin’ feeling, take a look at Lomo’s Belair X 6-12 City Slicker. It’s not just a 120 film-based medium format camera that costs $249 and shoots in 6x12; it can also capture images in 6x6 and 6x9 formats. The Belair X 6-12 has an electronic shutter with an auto-exposure range of EV 4 to EV 15 and unlike the rangefinder focusing Makina, uses zone focusing indicated on the lens in meters. A 90mm lens is standard and a 58mm wide-angle lens is included in the kit. A more stylish (than the basic black Belair) Trailblazer version costs $100 more. Who’s It For: Film shooters looking for a medium format panoramic camera at a bargain price. Why I Like It: If you read my December 2015 column you know that film is making a comeback and having a 6x12 medium format camera has always been a dream of mine. Now, I have to get a new scanner.